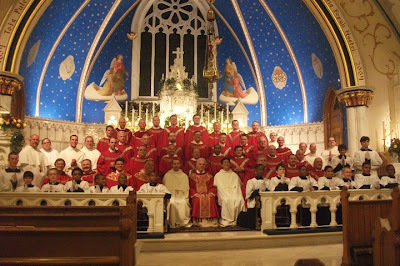 On June 29th, two of our American friars professed their Solemn Vows, at the Mercedarian parish of Our Lady of Lourdes, Philadelphia, thus definitively uniting them to the Order of Mercy. It was a momentous occasion for the Vicariate in the USA, the Roman Province, the Order throughout the world, and, indeed, the entire Universal Church. Fr. Francesco Podda, Provincial Secretary of the Roman Province, receive the vows of our two Brothers, James Chia and Scottston Brentwood. In attendance, as witnesses to the vows, were Very Rev. Fr. Richard Rasch, Vicar-Provincial of the USA Vicariate and Fr. Matthew Phelan, Master of Students. The other friars throughout the United States were also present to witness this grace-filled moment. Please keep our brothers in your prayers as they now, at some point in time to be determined, may be advanced to Sacred Orders. Furthermore, keep our brother-students in your prayers, as well, that in God's time they, too, might make public profession of Solemn Vows.